In 2008, Barack Obama told Chicago that he was “fired up and ready to go.” Monday morning, now on the other side of his two terms in office, he showed the city's students that he still is. 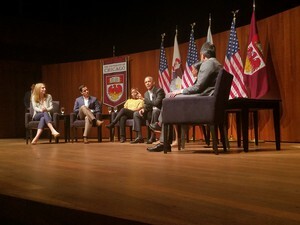 The former president kicked off his post-presidency public life at UChicago’s Logan Center for the Arts as students, educators, and community organizers from across Chicago gathered for a panel on young people in civic engagement. Six current students and graduates of Chicago schools participated in a Q&A panel onstage with Obama, discussing youth mobilization in politics, media in the age of the internet, and dialogue across the aisle. When the event was announced on Friday, the University and press outlets released few details. 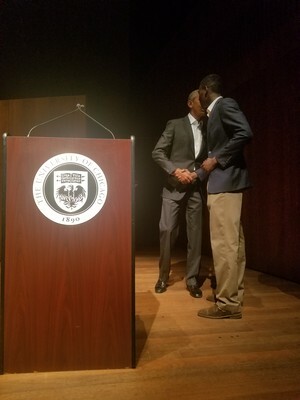 As students speculated about who would be invited to attend the event, second-year Richard Omoniyi-Shoyoola, who was in Regenstein Library at the time, received a personal call from an Obama staffer asking if he would introduce Obama. Obama hugged second-year Richard Omoniyi-Shoyoola after his introduction and said, "You have a serious voice." Omoniyi-Shoyoola told Obama "I learned from the best." He began to speak on the importance of young people to a healthy democracy. “Are there ways in which we can knock down some of the barriers that are discouraging young people about a life of service?” he asked. “I want to work with them to knock down those barriers. And to get this next generation and to accelerate their move towards leadership. Because if that happens, I think we're going to be just fine." For the next hour, Obama moderated the discussion, asking the panelists questions about their involvement in civic engagement and community service, which ranged from military duty, to volunteer work in New York’s South Bronx, to campaigning in Iowa. He also pressed them on how they think young people can be encouraged to play a greater role in civic life, and concluded by taking questions from the panelists. While the topics covered in the discussion were mostly serious, Obama kept the event lighthearted, making several jokes about his age relative to the panelists. UChicago’s panelist was third-year Max Freedman, who is involved in the Student Government Election and Rules Committee, the Institute of Politics, and UChicago College Republicans. Obama asked Freedman how he connects with campus Democrats and whether he feels that it is difficult for him to voice his opinion as a Republican on a mostly liberal college campus. Freedman explained that, for the most part, he values his role as a Republican on campus. Neither Obama nor the panelists mentioned President Donald Trump during the panel. Freedman told The Maroon in an interview following the event that students were not specifically instructed to withhold Trump’s name, but that panelists understood that references to the current political state were not in the spirit of the event. 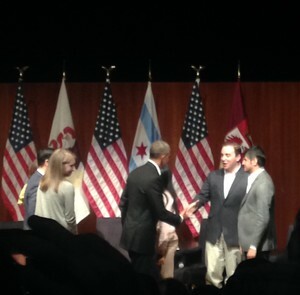 Obama shook hands with panelists and then with members of the audience following the event. Multiple panelists highlighted the importance of direct interaction between youth and their politicians. Panelist Tiffany Brown, who graduated from Hyde Park's Kenwood Academy High School and at the top of her class from Chicago State University for both her undergraduate and graduate degrees, told Obama that he had made a lasting first impression on her years ago when he was an up-and-comer on the political scene and she was still in high school. “Is this another story about how old I am?” Obama joked. Brown went on to recall how Obama and other local politicians had an event downtown where the Kenwood Academy concert choir was performing. She spotted Obama in the crowd. Before offering a round of handshakes to those in the front row and departing the Logan Center, Obama concluded the panel with the hopefulness that has become his trademark.